In my competitive cross country days, my appetite was never satisfied. What was for dinner was less a matter of taste, and more a matter of logistics: which foods delivered the most calories for the least cash. During high school, my parents were like Army quartermasters, marshaling mountains of pasta and three-helping portions of casserole du jour. In college—while putting in 80-mile weeks—my teammates and I descended upon the dining hall like marauding raccoons, gorging ourselves on tater tots, huge plates of anything and triple-decker sundaes for dessert. It was the “see food” diet—as in see food and eat it—that’s so popular with distance runners. All the while, though, our coach’s parrot-like mantra was, “Gaunt is beautiful.” And recent research shows that, from a runner’s perspective, he was right—to a point, at least. Simply put, losing weight almost always makes you faster. 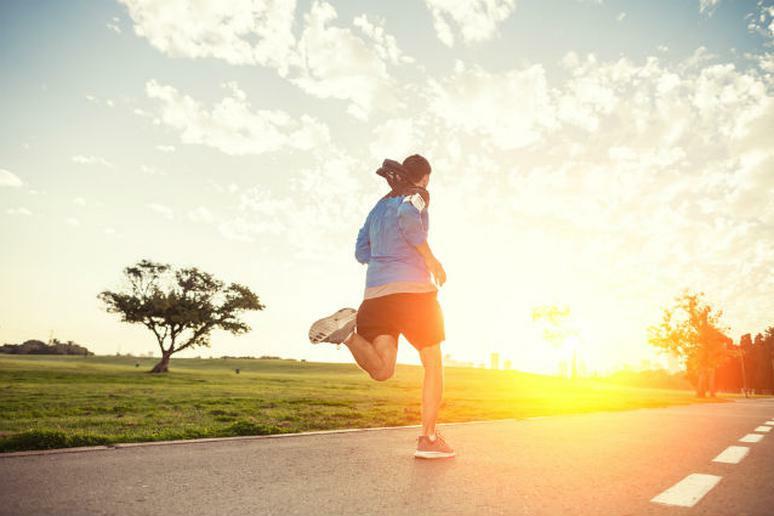 Assuming you’re healthy, you’ll run about two seconds per mile faster for every pound you lose. That’s because weight loss increases your VO2 max. It’s like when your car's gas tank is nearly empty, it gets better gas mileage. You’re still running the same engine, only with less junk in the trunk, which makes it more efficient with oxygen. And because losing pounds makes running easier, you should be able to train harder by increasing your workout distance and speed. Some runners, including my college-age self, don’t worry about weight. They figure that they burn so many calories, they should have a free pass at the dinner table. But those same runners will gain 3.3 pounds—and an inch around the waist—every decade, according to analysis of 4,700 middle-aged male runners by the National Runners' Health Study. That’s better than the average man, but it still adds up over time. These days, I ride my bike 10 miles roundtrip to work and still get in a few runs each week, but my number one sport—the one I spend 40 hours a week training for—is desk jockeying. (And I do it for you.) Needless to say, I don’t eat like I used to. What’s important to know, however, is that tempering your diet and losing weight will only improve your speed to a point. Lose too much weight—as judged by your Body Mass Index (BMI) dropping below 18.5—and you become weaker and slower, not stronger and faster. So how do you find your ideal weight for faster 5Ks, 10Ks and marathons? Several years ago, a University of Dayton (Ohio) runner and physiologist named Paul Vanderburgh, Ed.D., studied the subject. He devised a calculator to “equalize” performances among runners of different weights. He validated his calculator at several Ohio road races, where it correctly predicted finishing times based on weight and age. The Journal of Exercise Physiology published his study, and his “Flyer Handicap Calculator” is available online. It also includes age and gender factors (like decreased aerobic capacity), which means it can compare performances between vastly different runners—a 25-year-old, 115-pound woman with a 60-year-old, 200-pound man. Give it a try. “I hope the Flyer Handicap Calculator will level the playing field a little, and give more motivation to heavier runners,” Vanderburgh says. He advises runners who want to lose weight to get faster to lose fat, not muscle. It sounds obvious, but most studies have shown that exercise-based weight-loss programs help you achieve this goal much better than diet-only plans. So cutting back on carbs and sugars, continuing your running routine and throwing in a bit of weight training is a good way to cut fat and retain muscle. Not to mention a good way to get to your ideal race weight.